Ah... summer ~ the season of ice cream, slip-n-slides, flip-flops, and anime conventions. Here at Gesshoku it's the time when we get a brief 'catch our breath' moment in between supplying t-shirts for anime convention attendees, and stockpiling - ink, bags, tissue paper, shiny pins, and lots of energy - for an event so amazingly epic in proportion that it can only be known as ☆*:Dun Dun Dun:*☆ Back To School Madness! These bags are super roomy. We're pretty sure that not only your laptop will fit, but books, pens, and a lunch, will fit nicely too. Our messengers include a snapping pocket on the side for your phone/ipod, a very handy metal key fob to clip your set of keys, and an inside zip pocket for your pens and small media. And you can wear these bags any way you want - over the shoulder, or crossbody style - the comfortable cotton/canvas strap is completely adjustable - we have heard how amazing these are to carry as opposed to the more stiff and bulky feeling bags people usually end up carrying. So check out our messenger bags, and if you want to know all the intimate details on ALL of our different bags styles, check out our Bag Guide. It will tell you everything you could possibly want to know about all the bags we carry. 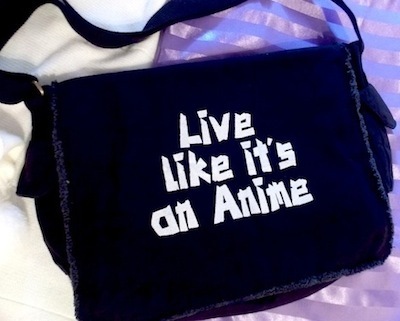 And remember, we can print most any design in our store on any bag you want (and any color we have available!) so just send an email our way using our contact form, if you don't see your favorite design on your favorite bag color! We'll be happy to put it up in the store for you ~ !